Product prices and availability are accurate as of 2019-04-16 10:26:36 UTC and are subject to change. Any price and availability information displayed on http://www.amazon.com/ at the time of purchase will apply to the purchase of this product. 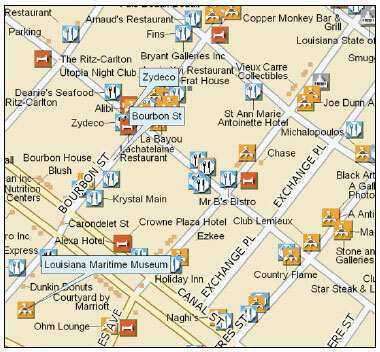 Geo-locate your business data on updated street maps (U.S. and Canada). 150 million phone listings. Automatic routing, 4 million places of interest. Large-format printing, GPS-ready with voice navigation. An affordable yet powerful set of mapping tools that allow businesses and advanced mapping enthusiasts to visualize their data on detailed DeLorme maps. Import and geo-locate your own text files from Excel, ACT!, and other database programs. Updated street-level detail for the U.S. and Canada, major roads for Mexico. Use the 150 million included phone listings to create databases (e.g., supermarkets within a radius), or find friends or services. Create driving routes automatically, with user controls to take the roads you prefer--avoid congestion or take scenic drives. Locate 4 million places of interest--restaurants, lodgings, attractions, truck stops, sports venues, and businesses of all kinds. Import aerial imagery. Add custom detail. Insert photos, documents, and Web links into your map files. Use MapShare to easily share maps, routes, and directions via secure Web link. Print a variety of map packages, including large-format plots. GPS-ready with voice navigation, new E-Z Nav wizard for on-the-go routing, and other high-end features. Import, edit, and map your vital contact manager data, or additional data from Excel or other sources. Complete U.S. and Canadian business and white page phone and address listings included. Everything you need to create, customize, print, and share detailed maps containing your own contact address locations, and much more. Create databases of your business information. Import, edit, and map your vital contact manager data, or additional data from Excel or other sources. Display radius information including acreage, square miles, more. Print notebook and wall-size maps for strategic planning, trade shows, dispatch, and other needs. 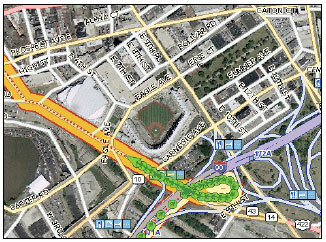 Create ultra-detailed maps for high-impact presentations. Situation: A real estate agency's clients are increasingly asking for details on each property's location. Currently, the agents mark the approximate location of the property on paper map, photocopy it and attach it to the listing report. This time consuming process does little to win the confidence of the client. Solution: Using Street Atlas USA 2010 PLUS, the property listings database is imported as a spreadsheet using the XData tool. Each location is accurately displayed on the map, and MapNotes are used to highlight properties that meet the requirements of the client. This powerful yet easy-to-used tool saves time, provides accurate results, and improves the efficiency of the agency. Complete U.S. and Canadian business and white page phone and address listings included. Query by Yellow Page category headings. Create and save custom phone and address databases. Turn phone numbers into places of interest you can find when on the road. 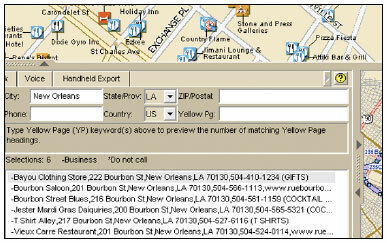 Right-click on a street and see all phone listings and locations displayed. Comprehensive tools for detailed desktop planning of your vacation or sales trip BEFORE you go, AND for on-the-go traveling using the latest electronic gear. Most other vehicle GPS systems are NOT planning tools and only track as you go. Support for Windows Vista, Pocket PCs, Windows Mobile 5.0 and later, UMPCs, and Palm OS included. Try out the new E-Z Nav wizard for on-the-go routing. Just search on any category (see below), choose your destination (retailer, hospital, gas station, friend's address, etc), and start real-time navigation with your GPS receiver. Great for daily and overall trip planning, too. Innovative GPS features: 2-D and 3-D NavMode voice commands, spoken directions, automatic back-on-track re-routing with off-route distance settings, high contrast mobile map colors, and much more. All in addition to the new E-Z Nav Search feature. Comprehensive street and POI updates for the U.S and Canada, now with Mexico highways. Over 300,000 new or updated roads for 2010. Powerful travel planning tools, MapShare, and many data types. Download $40 of aerial imagery FREE using included DeLorme Data Dollars and the software's NetLink tab. Imagery can be used with all of the Street Atlas USA routing, GPS, and draw tools. Not licensed from 3rd party companies, the updated maps and 4 million places of interest are produced by experienced mapmakers at DeLorme. The maps can be controlled using a variety of methods, including the traditional push-button zooming, which drills in/out while keeping the map exactly centered. Also, holding down the left mouse button enables you to drag and zoom, left-to-right, across the map, and moving the mouse in the same manner but in the opposite direction zooms out. DeLorme employs several powerful search capabilities within the software. The first is a simple box called QuickSearch where you type common requests including towns, cities, lat/lons, ZIP codes, street addresses, colleges, and many more to receive the quickest possible matches. 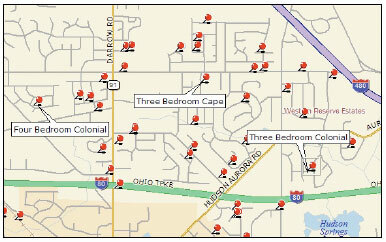 The places-of-interest search offers more advanced parameters and the advanced search is used when locating exact matches requires additional customer input. Plan a College Visit Tour. Add MapNotes; draw your own circles, polygons, and squares; measure the area of your draw objects--even draw in your own roads and route on them--these are amazingly powerful draw tools for the money. Right-click on the map to learn more about what's underneath your cursor. Lat/Lon, names of streets and bodies of water--even local radio station information--can be viewed in this manner. Moreover, the bottom toolbar of the software displays a continuously updated readout of what's underneath your cursor. Use your voice for issuing routing and GPS commands while tracking. Ask common questions such as "How far to my next turn?" and the software answers. Microphone recommended for optimal usage. The software also reads upcoming turn information, including the time to turn, time to finish, and name of the street to turn onto. New voice settings allow you to select how far in advance of your turn you'd like to be prompted. Voice can also be turned off if you prefer. NetLink is your online link to DeLorme for $40 of free aerial imagery now included with the Street Atlas USA 2010 versions. Select your areas of interest and download only those grids to the software. Toggle the imagery on and off in a single-screen view. Add notes and draw objects to the imagery to customize lifelike views from space. Included at no extra charge is the DeLorme Handheld software, which now includes support for Windows Mobile 5.0 and later devices. 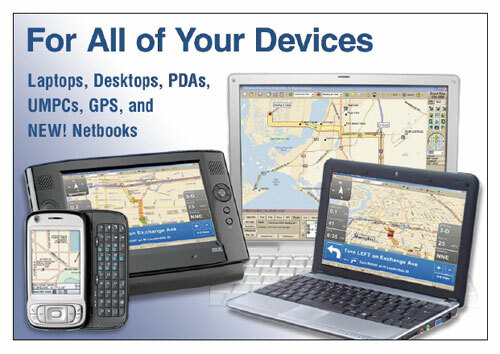 Access the maps you want from the desktop software and hot-sync to your PDA. Add a DeLorme Bluetooth GPS for use with Bluetooth PDAs and navigate wire-free. The DeLorme handheld functionality provides address-to-address routing, spoken directions, mobile map colors to reduce in-vehicle glare, and four million places of interest. Finding what you need is easy using the powerful search capabilities. Now you have powerful desktop mapping software and PDA software all conveniently provided in one Street Atlas USA 2010 package. New E-Z Nav wizard makes on-the-go searching and routing a breeze. Just search on any category (see below), choose your destination (retailer, hospital, gas station, friend's address, etc), and start real-time navigation with your GPS receiver on your dashboard. Great for daily and overall trip planning, too. NavMode brings together all the primary GPS controls and readouts needed when using the GPS. Large-screen views make it easy to see the map and directions. You can switch between 2-D (standard) map view and 3-D perspective view for lifelike views. Convenience and Security on the Road. Imagery can be used with all of the Street Atlas USA routing, GPS, and draw tools. Set your own keyboard shortcut preferences for optimum control when using GPS. The key-bindings function is very powerful and advanced so you can design your ideal in-vehicle navigation solution to your personal specifications. The easiest way for many to create and alter routes is to use the right-click feature. Select the route on your map and add new stops or vias, delete the route, all by simply right-clicking the object of interest. You can also add your own MapNotes or view the many pre-populated tags provided by the software. Create automatic routes using the quickest (time) or shortest (distance) routes. 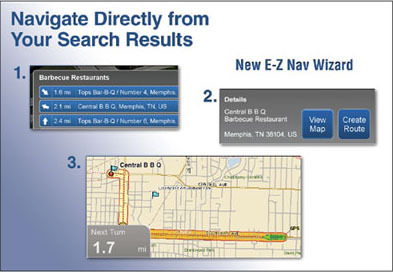 Use the E-Z Nav wizard if routing from a search result. Add VIAs to force the routing to take the roads you prefer. Turn on one-way indicators; select major areas to avoid; or select roads based on driving speed preferences. Add Stops and reorganize their order and the routing automatically recalculates. 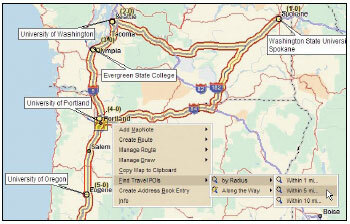 Create and manage routes either in the Route tab or by right-clicking on the maps. New translucent route highlight lets you see exit numbers and route shields beneath the route highlight. A DeLorme exclusive, this is the best way to update local roads when new developments are planned or added between DeLorme software releases. This tool is located within the Draw tab and lets you draw in the road segment, connecting it to another local road within the database. Assign a name, save it, and when you create automatic routes, the software is smart enough to include these new local roads in the routing calculations and also update the directions. Create and save commonly-used names for places you visit often, such as "home," work," or "Dad's." Once these names are assigned, the routing Starts, Stops, and Finishes also display these names making retrieval easy for repeated usage. Customize routes using your own names and save them within MapShare for others to see -- they'll be amazed. You can also include up to 200 names from your address book to be recognized using this system. Because all DeLorme map data is created, updated annually, and owned by DeLorme, we are able to provide many features typically reserved for expensive in-vehicle navigation systems. Free from the license restrictions and third-party dependencies of other publishers, we can also evaluate customer-submitted revisions and implement these changes after triple-checking all submissions. DeLorme currently has an enhanced commitment with staff in place to make as many customer revisions as possible. The DeLorme database contains over 4 million annually updated places of interest across the U.S., with additional ones in Canada, including restaurants, lodgings, gas stations, travel services, RV stops, truck stops, malls, shopping--just about everything you could ever need on the road. The software settings let you choose the magnification level to display the various POIs to void cluttering your map views. The POIs can be accessed using the many Find capabilities or by right-clicking on the map and selecting places based on type and distance from map center. Now you can travel with GPS and have the software find upcoming travel services based on their location from you. Find gas, hotels, shopping, and much more in your direction of travel and then easily make detours to these desired stops along the way. It's like having your personal travel concierge with you at all times. Using the Earthmate GPS LT-40, which turns a laptop PC into a powerful GPS navigator, it's possible to have the software offer new spoken and visual directions when you stray off course. Within the GPS tab of the Options section of the E-Z Nav toolbar, you can select or type the off-route distances you want to travel before the automatic recalculations kick in. Select short distances for city travel and longer ones for highway travel where you may exit frequently for roadside travel services. 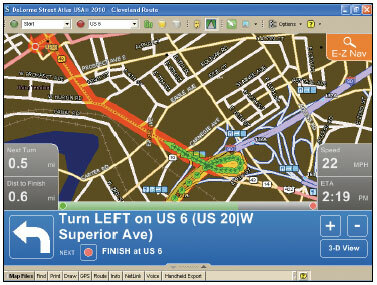 The software can offer voice directions indicating upcoming turns and street names. It also can be set up to respond to your voice and answer common travel questions--a very powerful capability for mapping software within this price category. Several different voice types are included. Print crisp color or black & white maps that you control to best match what is seen on screen. Also print Travel Packages containing strip maps and directions to bring on your trip. Don't want to use a lot of ink and paper? Then print just the Turn Details which show thumbnail maps of each of the decision points along your route. MapShare makes it easy to share your customized maps and directions with family, friends, and business associates. You create exactly the content you want and then post within our online MapShare library, which includes private administrative tools for you to manage. Similar to some of the better online photo resources, MapShare allows you to provide controlled access to your important maps without worrying about email and spam filters. This tutorial provides a guided tour of the main capabilities of the software. It is also included within the software along with a comprehensive Help section with links to online discussion groups where DeLorme customers can help you. 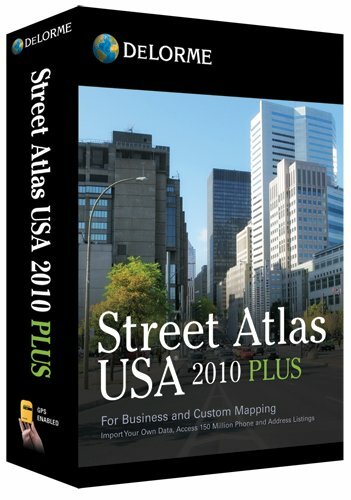 Street Atlas USA 2010 DVD contains the DeLorme produced and managed United States and Canadian street-level network. DeLorme highways and major roads for Mexico also included. The four million U.S. places of interest are updated annually based on phone book information and DeLorme's own research into exit services. Canadian POIs are also included, many with phone numbers.